Salad Girl Organic Salad Dressings is proud to announce our demo partnership with Sartori Company of Plymouth,Wisconsin. When you enjoy a "Salad on a Stick" featuring our Salad Girl Organic Salad Dressings at our demos in the Midwest Whole Foods Markets, Mariano's Markets, Angelo Caputo's Fresh Markets, Lunds & Byerly's, Kowalski's Markets, and many of our neighborhood co-ops in the Twin Cities, you will get to savor a bite of delectable Sartori cheese. Sartori Company is a fourth generation, family-owned and operated company that dates back to 1939. Their Sartori Reserve, Sartori Classic, and Sartori Limited Edition cheese varieties are all certified rBST-free. This means all of their cheese sold at retail is free of added hormones. 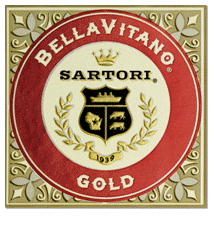 A Sartori-family original, this rich, creamy cheese with its nutty, fruity flavor is also — in all modesty — a celebrated gold-medal winner. Inspired by traditional, Italian farmstead cheese, BellaVitano Gold begins in the mouth like a premium Parmesan and finishes in award-winning style with hints of melted butter. This is where Sartori's artisan cheesemaking first began to shine.